If you’re wondering how worthwhile your website investment was, you might find yourself asking this question. A lot of people assume that having a website means that people searching on the internet will find it, but unless someone is searching for your business specifically, chances are they won’t be finding it anytime soon. Your business’s main keywords really need to rank high on the first page of Google to draw in those who are researching businesses or services in your industry. In fact, most people never investigate the second page of Google when they do a search (and if you do, welcome to the less-than-2%). So if you’d like to check your SEO against your competition and learn how to see your search rankings, you’ve come to the right place. 2. Type in your website address in their search bar and then press “Enter” or click “Start Now”. For this example, we’ll use one of our client’s sites, Richie’s Collision Center. Once you click “Start Now”, you’ll reach the domain overview page for your website. The screenshot below shows the rankings and search statistics for the Richie’s Collision Center website at the end of March, 2018. 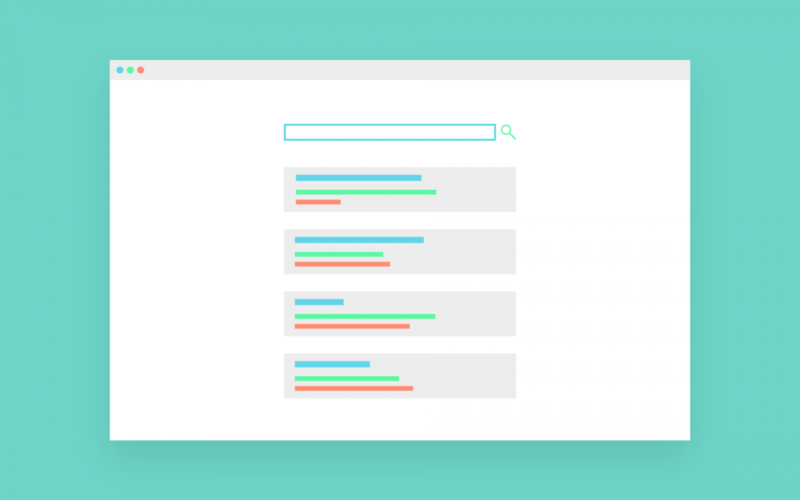 Here you can see an enormous amount of useful information, but for the purposes of this guide, we’ll be looking at search rankings (or more specifically, keyword rankings). 3. Under the “Top Organic Keywords” section, click “View Full Report”. If SEMrush isn’t showing any keywords for you, it’s could be because your website is new(er) and hasn’t been added to the SEMRush database, or (as often happens) because your website simply isn’t ranking for any keywords. However, if your website is being indexed and has keywords ranking, the organic search report page is where you’ll see them. 4. Click the “up” arrow in the position column (as highlighted) to see what keywords you rank highest for. 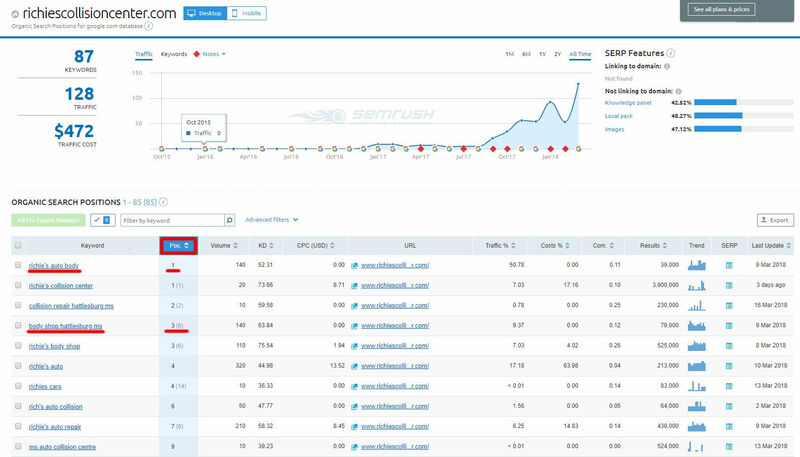 Since we’re demonstrating with the free version of SEMRush, only the top ten keywords are visible – but for a quick analysis, this is probably all you’ll need. These are the rankings you’re looking for, but if you’re a little confused, here’s what all of this means. 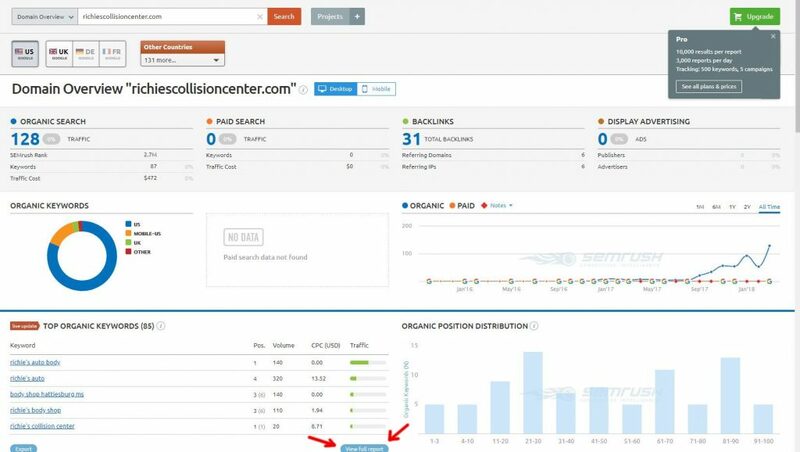 SEMRush is checking organic search rankings, which means that – location or search history factors aside – this is the position your website will be seen in when people search for a given keyword. In this example, Richie’s Collision Center was ranking #1 for the keyword “richie’s auto body”. This means that when people search for that keyword, they will see them in the #1 spot on those Google search results (provided those rankings are retained). You might see another number in parentheses next to your keyword’s position (such as on our keyword “body shop hattiesburg ms”). That’s where that keyword was the last time SEMRush indexed the website. It’s worth mentioning that keyword rankings tend to fluctuate due to changes in Google’s algorithm. Brief, temporary drops are fine and normal. They aren’t necessarily anything to fear as long as you continue to follow SEO best practices and do consistent work to boost your search rankings compared to your competitors. But in the event that your website isn’t ranking for the keywords relevant to your product or service, you may want to consider making some changes. You may need more consistent and powerful SEO work done (such as blogging and backlink building) to get your site ranking higher. And that’s how you check your search rankings! We hope that you’ve found this short guide helpful. If you are interested in learning more about improving your website’s SEO, please sign up for our newsletter below! We consistently find and create helpful content! Sign up for our newsletter to get a regular dose of marketing help for your business.